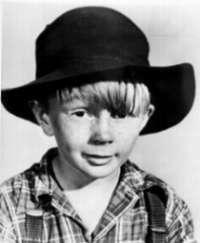 The 1956 film character of Smiley, the young and loveable boy from the bush, has become an icon of the Australian personality. Colin Petersen was the nine year-old from Kingaroy who won the lead part and became an overnight film star. 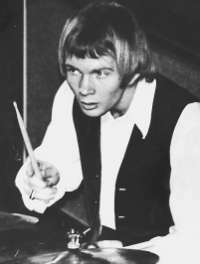 Within a few years he went from child screen sensation to international rock n'roll drummer with the Bee Gees. Colin grew up like many a country boy in the 1950s, plenty of space, the odd scrape and many boyhood adventures. He lived in Kingaroy until the age of seven when he moved to Margate, close to Brisbane. Colin was loved by his parents, particularly his mother who was always quick to further the progress of her talented son. "Lots of boys had dancing lessons in those days," says Colin. "We followed stars like Fred Astaire and Bo Jangles and I started tap dancing; just beating out a rhythm with my feet, and I think that's why I started to play the drums. Dad found me an old drum on a stand and a cymbal. I had been playing the drums and tap dancing in concerts about three years before the Smiley film came along. It was in 1956, and I was nine. My mother read in the Courier Mail that auditions were being held all around Australia for the character of Smiley in this new feature film. I was so into the drums that it hadn't occurred to me to be an actor. So I went along with Mum on the tram to the audition at a New Farm cinema. There were hundreds and hundreds of kids. It was a big deal in those days. I went in all dressed up in a Terylene suit, long socks, shiny shoes and tie and my scrap book of concert performances". "The director, Anthony Kimmins, looked at my scrapbook but kept going down the line of boys. I thought that's it and I went outside to Mum. She said, ah well Colin, it wasn't meant to be. We went on the tram to my grandmother's house and I got out of my Sunday suit and put on a pair of shorts. I was in bare feet playing marbles on the dirt floor under the house. For some reason, later in the afternoon, I decided to go back to the cinema to see what was happening. So, I got back on the tram and then walked down the alleyway beside the cinema. Suddenly the director came out of a door and lit up a cigarette." "I stood there, dirty knees and old shorts and he didn't recognise me from our first meeting. But he looked at me for a long time then asked if I would like to audition for the part of Smiley. I said yes and we sat down on the steps and he opened up the script and, for about half an hour, I read the Smiley part and he played the other parts. Then he asked me my name and phone number and he told me he would be flying me down to Sydney in a couple of weeks for a screen test. And that was it." The Smiley feature was a hit in the UK and Australia. Colin's youth and natural performance won over audiences and the British media. Colin and his mother set off for London to see if they could capitalise on the success of Smiley. They hired an agent and Colin started school. Two films followed, The Scamp (1957) with Richard Attenborough and A Cry from the Streets (1958) with Max Bygraves and Dana Wilson, (the star of Shiralee with Peter Finch). "I was offered Tiger Bay, the film that Hayley Mills eventually did. But Mum thought I was entering a period of my life where that childlike appeal had gone. She told me I was going into my 'awkward years' and I wouldn't be offered any more films. So she pulled the plug on my film career." "But it wasn't a big deal for me. A lot of school mates would give you a hard time and I would get into fights because they resented me being an actor. We came back to Australia and I managed to get through my teenage years. I was really only a pseudo delinquent, but always trying to be one of the boys. My parents eventually sent me off to boarding school, Ipswich Grammar School. That's when I took up the drums again and eventually met Maurice Gibb." "The Gibb family came out to Australia in the same year that I finished making my third film in 1958. Maurice said he was captivated by Australia by watching Smiley. By the early sixties I was listening to the Beatles and I started to write songs with a friend from Ipswich Grammar. We formed a band and decided to go to Sydney. For two years we battled on in Sydney, living practically on nothing. We played R & B with The Animals, The Pretty Things, The Who, The Stones. I first met Maurice at a Sydney gig and I became friendly with the family. They simply couldn't break into that teenage audience. But we weren't making any money at all. I was sleeping in my car for weeks on end. So I decided to go to England to try to get back into films". England was a magnet in the early 1960s for Australian bands. The Gibb brothers had become The Bee Gees in Australia and even though their song, Spicks and Specks went to No 1 in October 1966 the Gibbs were on a ship for London by the end of the year. Colin met up with them in London. However there was no work lined up in the UK when they arrived. Nevertheless they had sent demo tapes to Beatles manager, Brian Epstein who passed them on to Robert Stigwood, and he was to become the Bee Gees manager and producer. Barry and Maurice Gibb and Colin continued as the Bee Gees, but further arguments continued as Colin raised questions about Stigwood's conflict of interest as the Bee Gee's manager. Stigwood also owned their recordings and publishing, and was in effect their employer. Colin believes this led to his being fired from the group in 1969. "We were on a paltry royalty. We signed a record contract with him. It was an extraordinary experience. I lived very well in those years but I ended up with very little money in the bank. I was involved in litigation over money with Robert Stigwood that went on for three years. I finally settled with them and their stipulation ... signed off by the British courts ... was that I would never again seek to make my livelihood as a drummer. That was the Bee Gees parting shot to me. It was interesting though that Barry later wrote me a letter saying that it was Stigwood, not the other band members who insisted on me being sacked. He regretted it and he wanted me to know that I was a loss to the Bee Gees sound". Despite the astonishing court injunction that stipulated Colin never again sit professionally behind a drum kit, he went on to work in the music industry, producing tracks for Irish singer, Johnathan Kelly during the 70s and later producing albums for CBS Records.